I was a little rushed Saturday morning. The game was at 12:05, I didn’t get up until after nine, and I still had to finish up my blog post for Friday’s game. I don’t know what’s going to happen when I have to drive back from a road series. My goal is to get every post up before the next game, because things are more fresh in my memory, and it’s less likely that I’ll get things mixed up as to which game was which. I didn’t know this when I decided to stay with my aunt and uncle, but they don’t have wifi. I was a little thrown off by the curveball, but I managed. Since I paid the extra money up front for the Verizon iPad (as opposed to just the one with wifi), I was able to get one gigabyte of data for $20. It’s for a month, but there are no contracts, so I’ll likely just cancel before the next period, because most everywhere I go will have wireless internet. Victoria and I left for the game at 10:40 and made the 30 minute drive to Busch Stadium. We found $5 parking on Friday (which is the cheapest you’ll find), and went with the same place today. 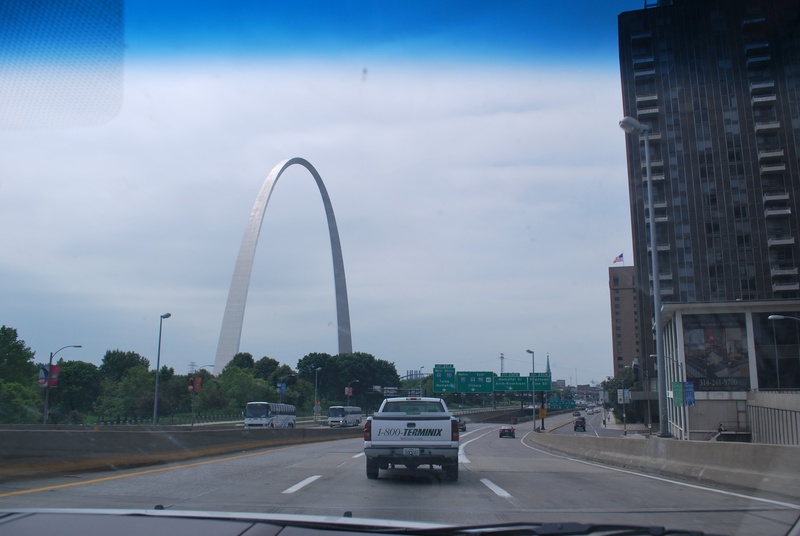 When we were coming down I-70, and just getting to the city, we got a great view of the arch. It’s a short ten minute walk to the stadium from where we parked, and we made it inside by 11:25. 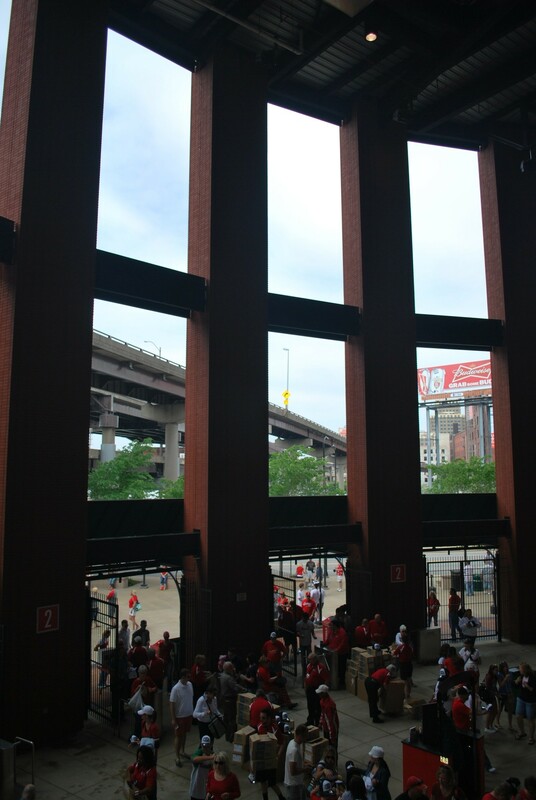 Before heading upstairs, I snapped a picture of the home plate entrance from the inside. I love Miller Park, but open air stadiums are hard to beat. I will never be mad that Miller Park has a roof, because I’m most interested in the games, and a guaranteed game rules supreme. You can see stadium staff handing out a promotional item below, which was a World Series Champions Hat, ugh. Tomorrow is a miniature World Series Trophy. I’m planning on selling them all to Cardinals fans when I’m there tomorrow, we’ll see how it goes. I tried selling the hat to a few people today, and they all just wanted it for free. The fact that I won’t wear it no matter what doesn’t give me much bargaining power. We took the stairs behind home plate all the way to the upper deck, where we sat for today’s game. In the stairwell they have the different Cardinals logos going back to the ’30s. They really haven’t changed much, but I took a picture of each one because I thought it was cool to see the (slight) variations. They don’t need descriptions, and I’m sure you can figure it out. I’m not sure what happened between ’32 and ’37, or why the ’49-’65 one doesn’t have ’51-’55 removed, but it’s still cool to see how the artwork has changed. We were sitting in section 449 for the game (and paid $56 a ticket after fees! 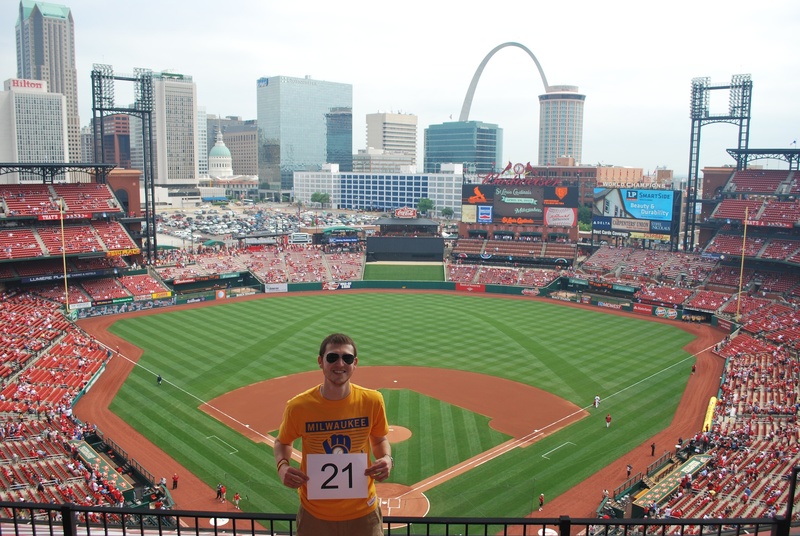 ), but I had the game number picture taken from 450, because that one is directly behind home plate. It’s crazy to think that the season is 13% over! The cloud cover kind of washed out the sky, but it’ll have to do. 1) Interstate 64 in the background, and the Busch Stadium sign in the upper right hand corner. I took it just to show how close the interstate comes to the stadium. 2) A close up of the two scoreboards that the Cardinals use. The stadium was just built in 2006, but things get outdated quickly. Their replay board (left) isn’t very impressive, and I can see the Cardinals replacing it with a much larger hi-def board like the Brewers installed at Miller Park prior to the 2011 season. 3) You can see their banners in the 2nd photo, but I took a close up of the flags that represent the World Series that they’ve won. If we can get just one at Miller Park before I’m gone, I will be happy. I know nothing is guaranteed, and when you’ve got teams like the Yankees at Red Sox with bottomless pockets, it does seem unlikely. In saying that, Attanasio has done a tremendous job in his first seven years, and I’m looking forward to being a Brewers fan until the day I expire. 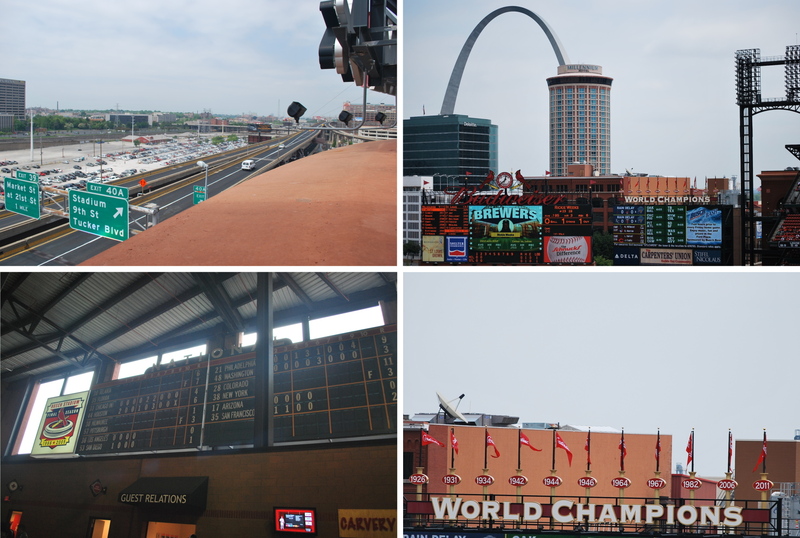 4) The Cardinals scoreboard from the 2nd iteration of Busch Stadium, which stood from 1966-2005. The first Busch Stadium was more commonly referred to as Sportsman’s Park, because that was it’s name for most of its existence. The game was more entertaining today than it was yesterday, not falling behind 10-1 after three innings definitely helps. 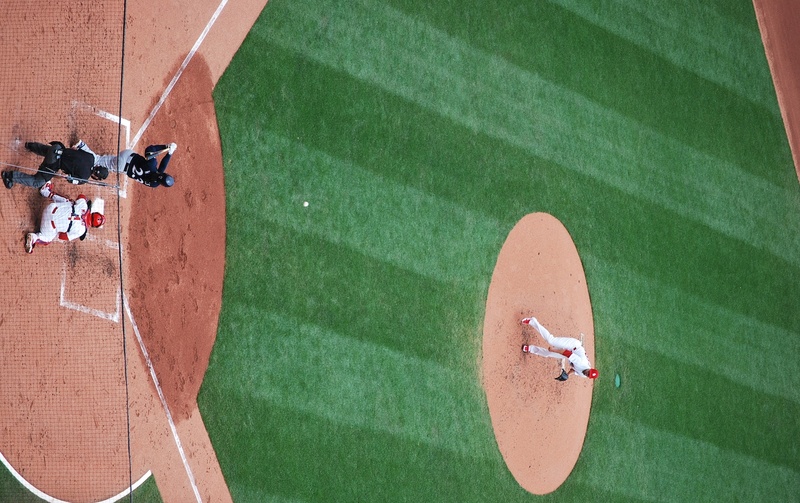 The Cards had a 2-0 lead after three innings, but after solo runs in the 4th, 5th, and 6th innings, the Brewers tied it up at three all heading into the bottom of the sixth. The Cardinals scored two in the sixth and two in the eighth, and that was that. Final Score: Cardinals 7 – Brewers 3. The last three games the Brewers have been outscored by a total of 18 runs (27-9). They won’t be winning too many games if they give up an average of nine a game. Greinke is on the mound tomorrow, so I’m hoping he can right the ship. That is, of course, *IF* there is a game tomorrow. Right now the forecast has between a 40 and 60% chance of rain predicted between 9 am and 8 pm. I might be in for a long day at the park tomorrow. We picked up ponchos on Friday, so at least I should be able to stay dry. I will leave you with this picture from my seat in the upper deck. It’s of Rickie Weeks, just after making contact, he wound up beating the throw for an infield single. It was all for naught, however, as Gomez followed him with an inning ending double play. Ben……if you cant sell the replica trophy at the stadium…..I will buy it from you…..cannot make the game. Enjoy and good luck the rest of the season! !